We know to really "Bring Out The Best" for your guests we need to do more than just taste great! Best Foods Real Mayonnaise for Food Service Gallon is a perfect balance of acidic and sweet flavor. The ideal condiment for sandwiches, burgers, dips, dressings and preparing bound salads. Soybean oil, water, liquid whole egg and yolk, vinegar, salt, sugar, concentrated lemon juice, calcium disodium edta (used to protect quality), natural flavor. We know to really "Bring Out The Best" for your guests we need to do more than just taste great! 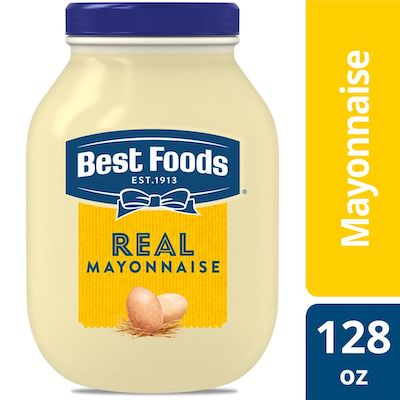 Best Foods Real Mayonnaise Gallon for Food Service (128 oz) provides the highly desirable balance of acidic and sweet flavor notes to enhance your menu items in a way that is unmatched by other brands. Our delicious Blue Ribbon Quality Mayonnaise is made with real eggs, oil and vinegar sourced from trusted American farms. Maintains cling, consistency and stability - even when heated. Superior emulsion resists breaking down while your recipes retain outstanding texture, mouth feel, flavor and eye appeal. Outstanding performance reduces waste and lowers cost. It’s the ideal condiment or use it to make outrageously delicious entrees like juicy burgers, parmesan chicken, chicken salad, potato salad, and tuna salad (perhaps a moist Chocolate Cake ?!). Check out other products in the Best Foods or Hellmann’s assortment! Best Foods is known as Hellmann’s East of the Rockies.